Anyone care to estimate how big losses would be if you rolled 10 year US Treasuries at constant maturity for next 10 years w/ 25 bps of rate rise per quarter? A 25 bp move per quarter is roughly a 2% loss per move given the current duration of around 8 years (0.25% x 8 = 2%). So an investment would lose money each quarter until the yield (currently 2.4%) is greater than 8% (8% / 4 quarters in a year = 2%, which would offset the loss from the rate hike). Given an 8% yield would happen during year 6 (6 years x 4 quarters x 0.25% = 6% hike + current 2.4% = 8.4% at the end of year 6). Year 6 is around midway of the 10 year horizon, so total return would be close to 0% cumulative over the ten years. This was pretty close to being correct. The chart on the right shows the path of rates assuming a 0.25% rise per quarter, while the chart on the left shows the cumulative return for an investor (slightly above 0% over this period). In the above example, a 0.25% rise per quarter (1% per year) is pretty extreme, but even a smaller 50 bp / year rise would result in lower returns (~10%) than no move (1.024^10-1 = ~27%). Another problem for investors is that a rise in nominal rates does not occur in isolation. 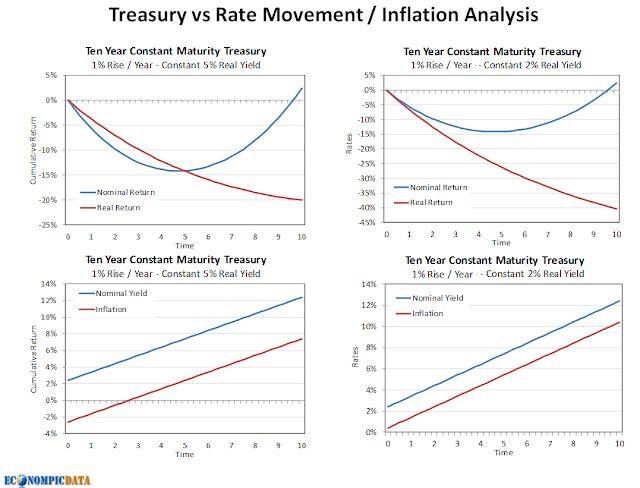 A rise is typically a function of a credit concern (much more likely with corporate / muni debt than treasuries), supply / demand imbalance, or inflation. For this exercise, I'll focus on the impact of inflation. Nominal rates moved relatively closely with inflation from the late 1980's until the global financial crisis as investors demanded a real rate (nominal rate less inflation) of ~2% over that period (the recent period of QE pushed them much lower). 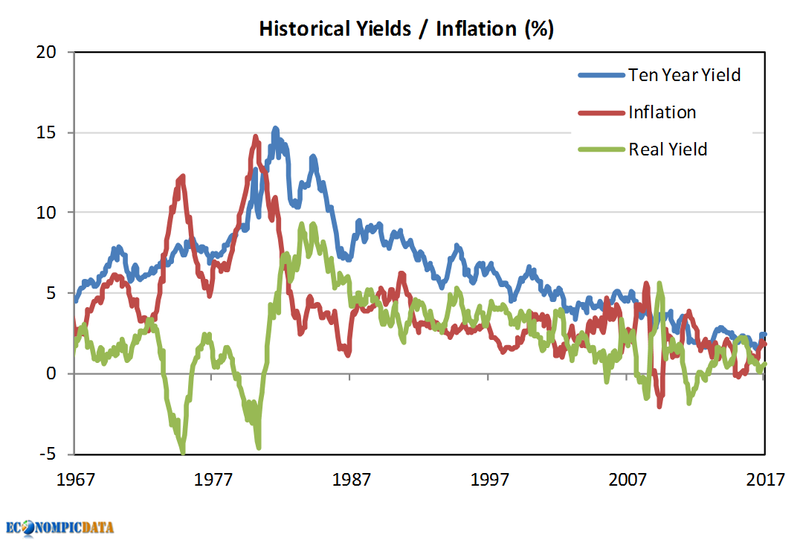 It's the 1970's that highlights the real risk of inflation in a rising rate scenario; inflation overshot expectations, which created an environment in which inflation pushed real rates into negative territory (bond investors lost from rising rates and negative real carry). Back to the scenarios... taking the same 0.25% rise in rates per quarter (1% / year) shown above and applying two alternative inflation paths, the left hand chart below shows the return profile if real returns were a constant 5% (i.e. 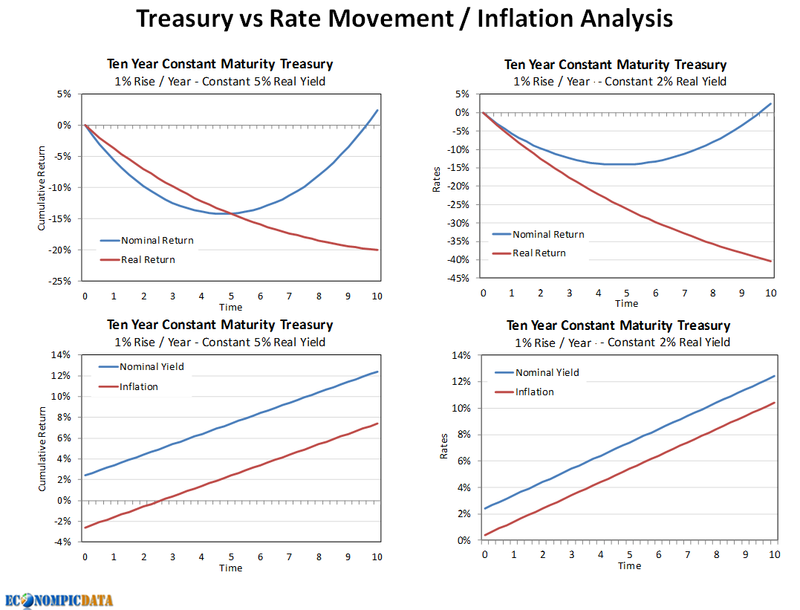 inflation was consistently 5% below nominal treasury yields - in itself very optimistic for investors), while the right hand chart shows the return profile if real returns were a constant 2% (i.e. 3% higher inflation on the right hand side than left). In either scenario, the returns are decimated (not surprisingly... when inflation is higher, they are decimated more). If you think the nominal return paths are too pessimistic (likely), let's take a look at a few scenarios that seem like pretty realistic possibilities based on market expectations for both rates and inflation. 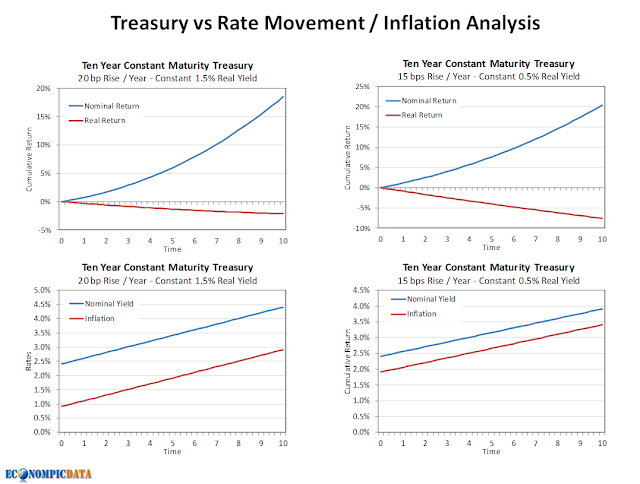 On the left hand chart we show a 20 bp rise per year with 1.5% real yields (settling at ~4.5% yields with 3% inflation) and on the right hand chart we show a 15 bp rise per year scenario with 0.5% real yields (settling at ~4% yields with 3.5% inflation). In each of these scenarios there are cumulative losses over ten years in real terms. My takeaway... if you think rates are poised to rise in the future... think twice about owning them. While the risk-free return of cash is hard to accept at current levels, that return may end up being more attractive than the return-free risk of bonds if rates do rise.